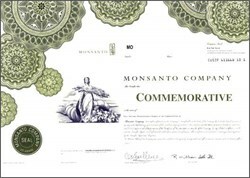 Beautifully engraved unissued certificate from the Monsanto Company. This historic document was printed by the American Banknote Company and has a vignette of a women holding wheat. This item has the printed signatures of the companies Cheif Executive Officer and Secretary. Monsanto provides a wide array of integrated solutions to help meet the needs of growers and commercial customers who need to control unwanted vegetation safely and effectively. Monsanto also provides products to the dairy industry to increase the efficiency of milk production, and seeds for several cropping systems. Its flagship product, Roundup, is the world's #1 herbicide. Monsanto also produces genetically altered seeds that tolerate Roundup and resist bugs; it estimates that most of the world's insect- and herbicide-resistant crops bear its stamp. The company became a wholly owned subsidiary of Pharmacia when Monsanto and Pharmacia & Upjohn merged in 2000, but consumer apprehension over so-called "Frankenfoods" and the like prompted Pharmacia to take the company public. Pharmacia still owns 85% of Monsanto.